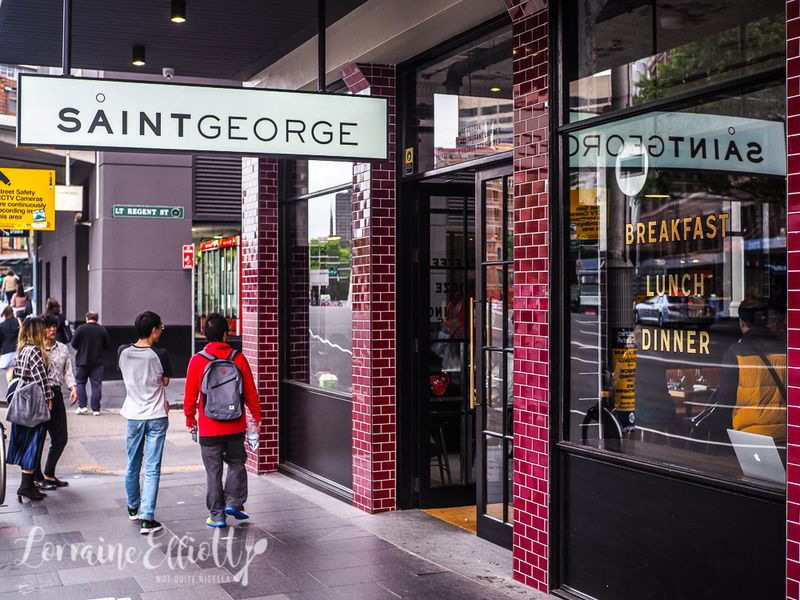 Chippendale's newest eatery Saint George sits at the busy Broadway end of George Street. The window signage proclaims a cheeky "Coffee and booze for the working class" as a homage to Sydney's workers. 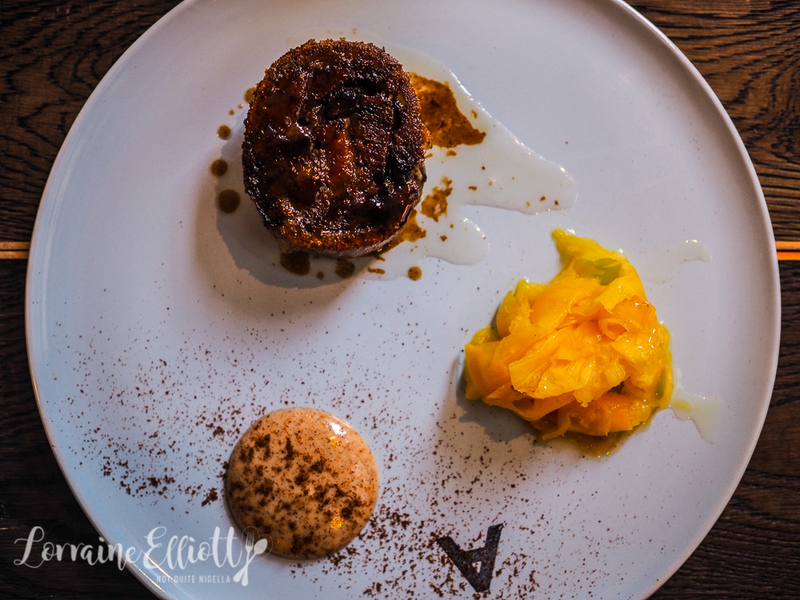 Open for breakfast, lunch and dinner, it offers a twist on the usual offerings but dinner is where things get interesting. Every morning I send my friends the latest restaurant, recipe or travel story from my blog. If you'd like to wake up to a delicious email just enter your email address below. The 45 seater eatery was formerly a convenience store but all traces are gone. 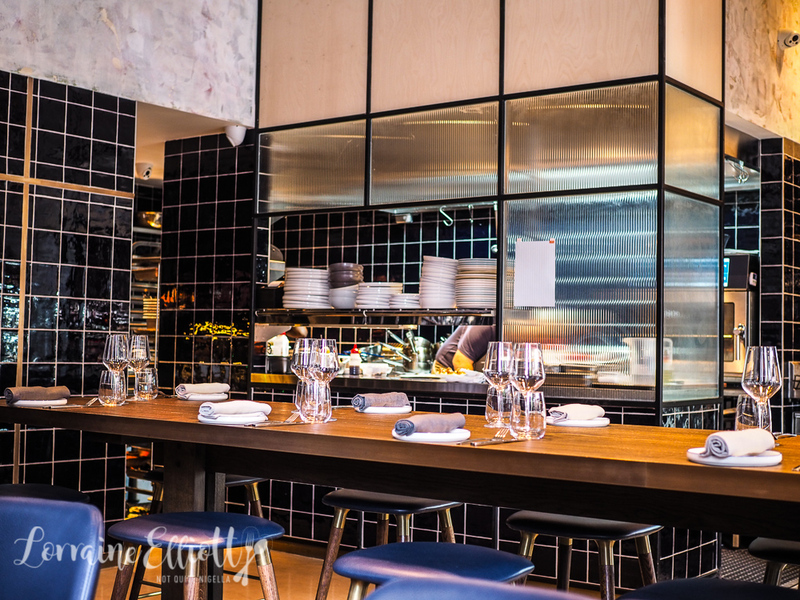 Inside there are black tiles, a long share table, wall banquettes and a meat slicer where staff slice a selection of cured meats to order. 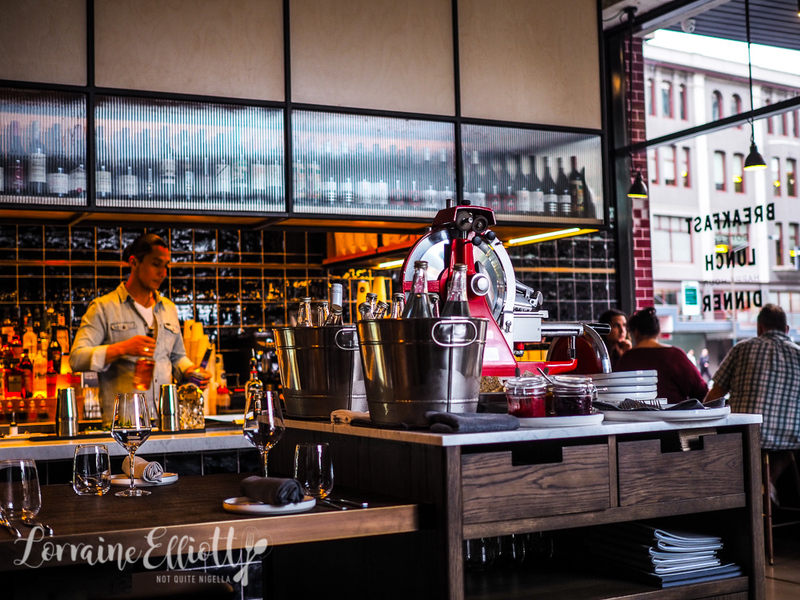 The drinks list has a playful range of signature cocktails and a predominantly Australian and New Zealand list of wines. 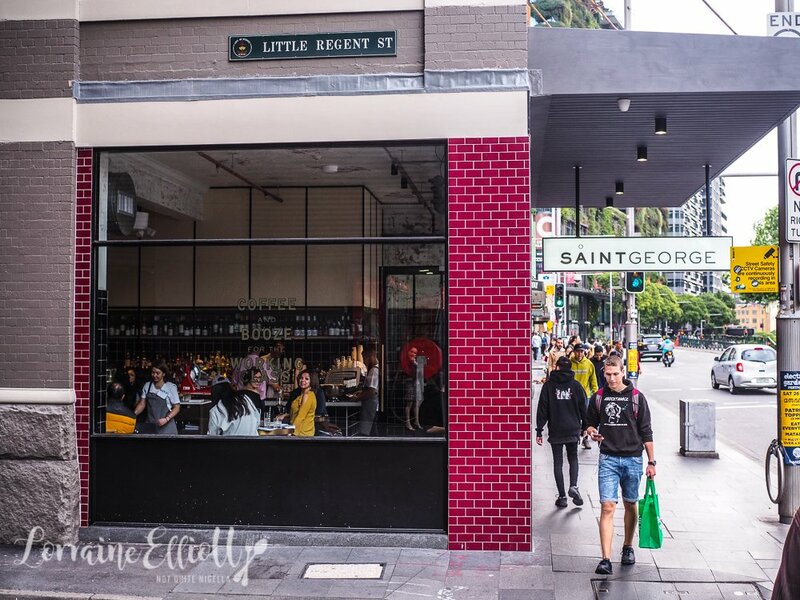 The chef behind Saint George is James Metcalfe who has a fine dining background having worked at Becasse and Michelin starred restaurants as well as The Bellevue. We arrive at 6pm and it is busy with some Sunday afternoon cocktail drinkers merging into dinner customers. Ivy and Ryan arrive soon after. I order a Brown Eyed Girl cocktail with Goslings Black Seal rum, vanilla liqueur, chocolate liqueur, chocolate bitters and sugar syrup while Ivy has an Earl Grey Martini made with Earl Grey tea infused Bombay sapphire gin shaken with lemon juice, sugar syrup and egg whites. 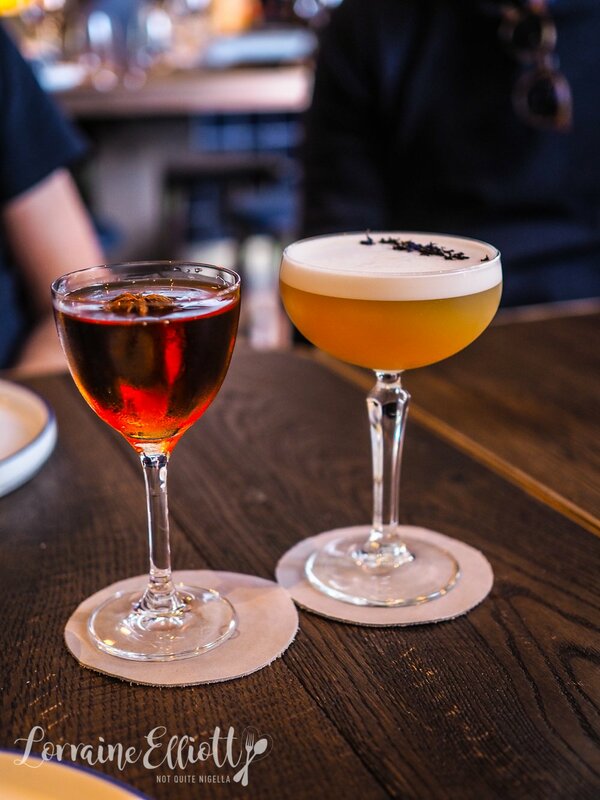 We love both especially the Earl Grey Martini with its distinct floral aroma. Our next decision is what to order to eat. "Is it too much to order pork twice?" I ask Ivy. "Nope," she answers straight away. See why I love eating out with her? Enablers are the best. 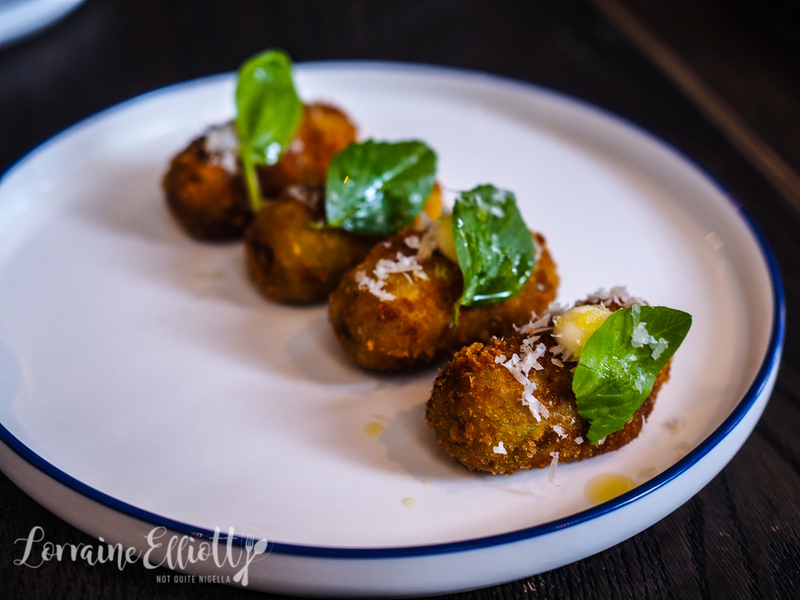 We start with some pea and parmesan croquettes with a basil leaf on top. They're lightly crunchy on the outside and soft and melting on the inside and the basil gives it a nice accent of flavour. 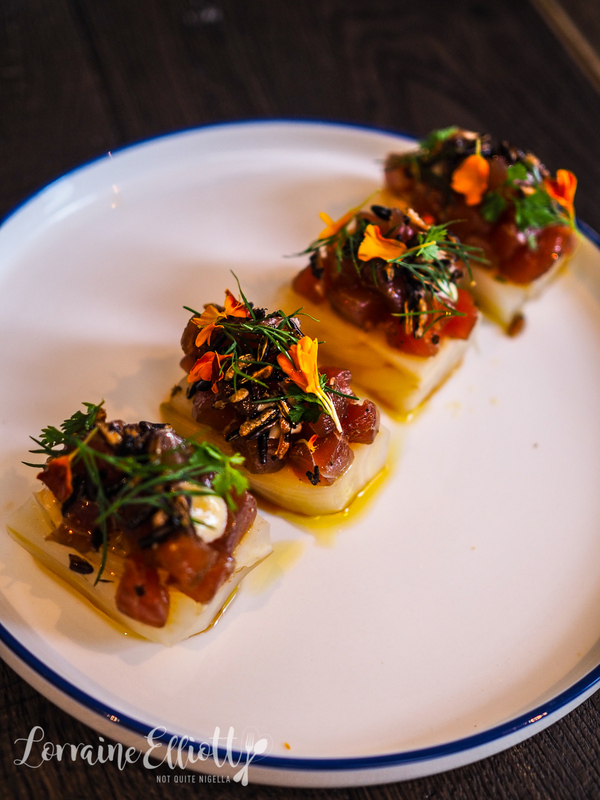 One of my favourite courses is the chopped tuna on top of candied fennel bulb slow cooked in sugar and vinegar syrup topped with spring herbs. The tuna has a lovely spiced flavour from an aromatic salt mixture and it is then dressed in soy, mirin, Chardonnay vinegar and sesame oil. 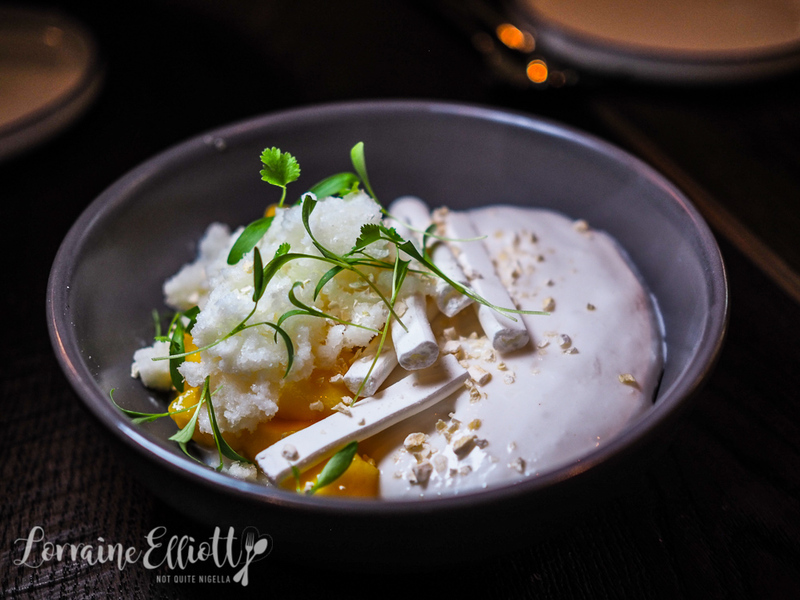 There's a miso emulsion, puffed rice and marigolds and it hits all the sweet and savoury notes and I could have happily had this whole plate to myself. 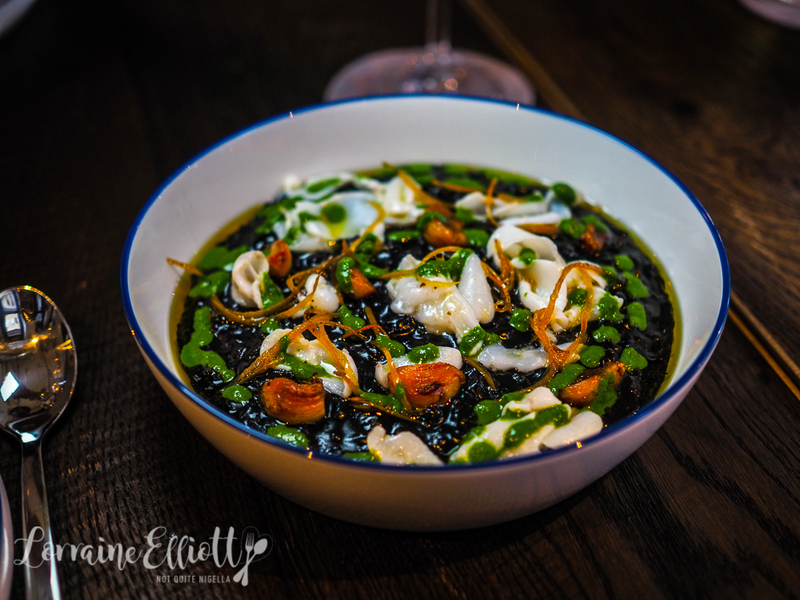 We also like the richness of the squid ink risotto which has a wonderful texture to it-not too much bite but just enough and just the right amount of luscious squid ink sauce. The rice used is vialone nano, an Italian semifino rice. On top is buttery soft line-caught squid paired with a parsley puree with pickled lemon and roasted garlic. I finished off this risotto scraping the spoon against the bowl. Now this is the sort of dish that separates the women from the men. While Ivy and I were happy for an actual pig's head to come out (although I suspected a fine dining chef may hesitate to do that), Ryan blanched a little at the idea of a pig's head. "I would never order this," he said shaking his head. Luckily we were ordering. This is such a luscious dish that starts with a de-boned pig's head which is then confited in duck fat. The fat is removed and shaped into a ballotine and it is then sliced and pan fried so that it is crispy. My mouth is watering now thinking about this. Of course the pork is lusciously fatty but that's where the thinly sliced spiced pineapple pickled in Chardonnay vinegar, saffron & coriander seeds comes into play and there is also a star anise emulsion that provides aroma and creaminess. The roast pork jowl comes out with the sides. There are four slices-perfect for the four of us sharing and the pork has a wonderful crunchy crackling and melting meat underneath. 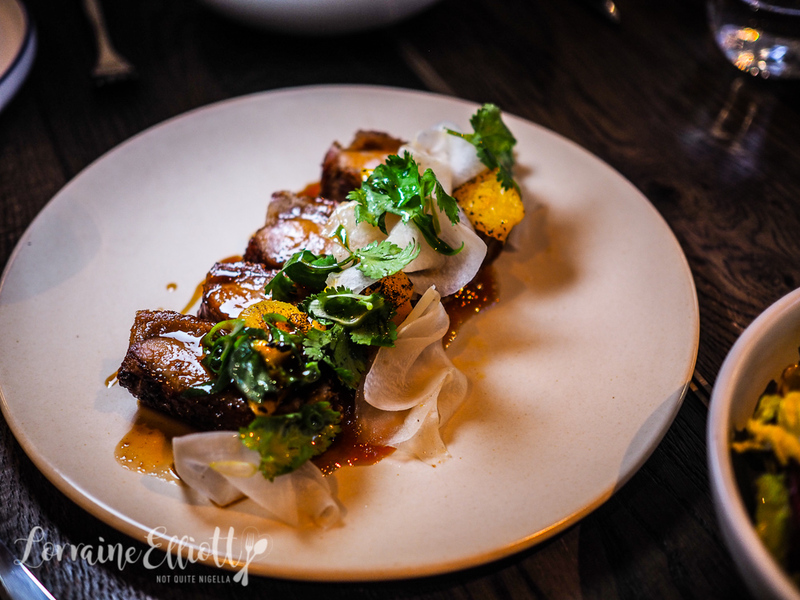 It's paired with torched mango, thin slices of pickled white radish with plenty of spices and an Asian Salad with Thai basil, Vietnamese mint, coriander & shallots. It is finished with some roast chicken jus gras. 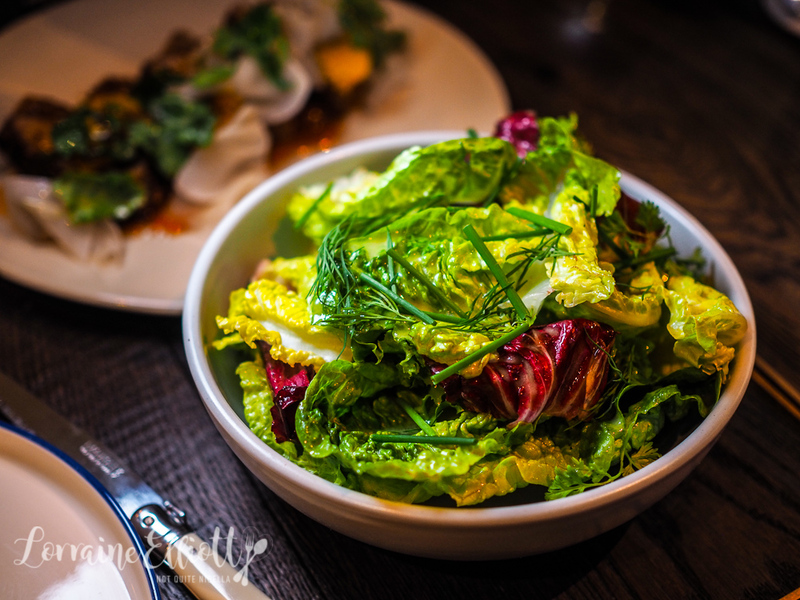 The salad is a simple salad but done well and perfectly dressed. It goes really well with the pork above as it needs a fresh element to complement it. And it's hard for us to pass up fries. These come as they are but we ask for ketchup, mayo and mustard to dip them in. 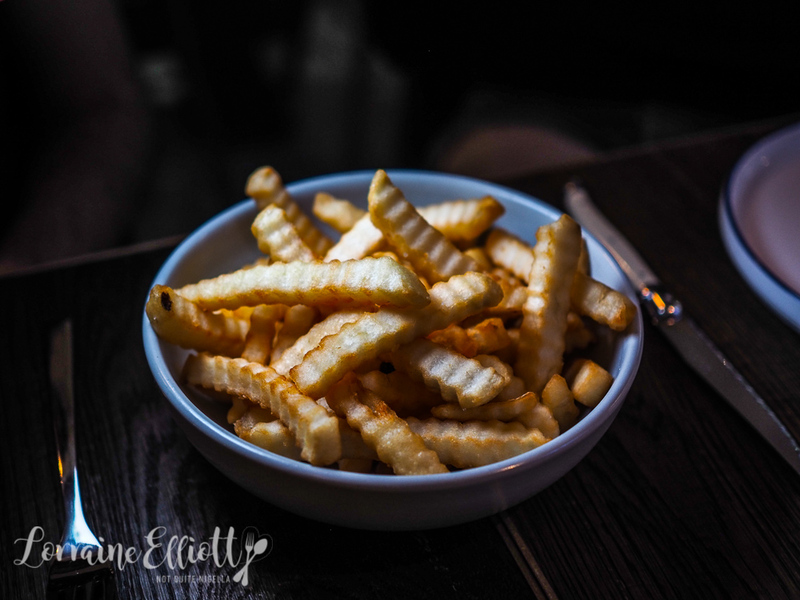 These are old skool crinkle cut fries. It's time for dessert and there are three plus a cheese plate on offer. We go with two mousses based on our waitress's recommendation but they are quite different propositions. 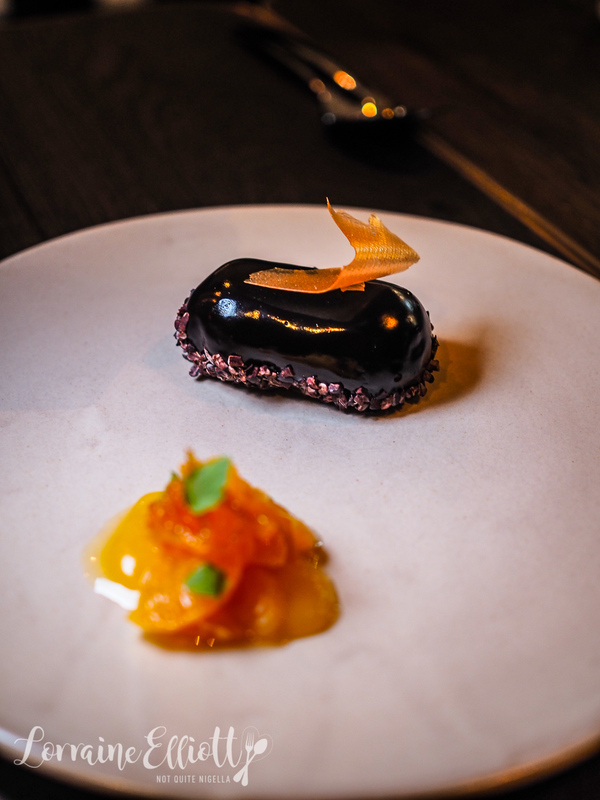 The Valrhona Manjari mousse is really a short eclair shaped dessert that is denser than we expected and edged with crunchy cacao nibs. It's more like a chocolate cake really than a mousse. The lime and coconut mousse is very refreshing and it's a surprisingly sizable dessert too. With the intense flavour of coconut cream with a touch of lime there are fresh mango chunks and a mouth puckering lemonade milk granita. So tell me Dear Reader, have you ever ordered the same protein twice during a meal? And would you order the caramelised pig's head? This meal was independently paid for. Follow Not Quite Nigella on Email, Instagram, Twitter, Pinterest, YouTube and Facebook. Every morning I send my friends the latest restaurant review, recipe or travel story from Not Quite Nigella. If you'd like to wake up to a delicious email just enter your email address below.